Love this unusual shaped edge card. Thank you. Shirley, thank you so much for this card, it is stunning. I can see myself using it numerous times for different occasions. Thank you again. Stunning Shirley, your cards are always beautiful but this must be the best yet. So many thanks because if you hadn't already guessed, I love this one. This is lovely, thank you so much. Thank you also for the heart card. It will do perfectly for my valentines day card. 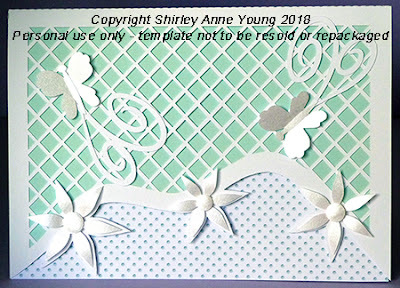 Such a beautiful design Shirley, you are always so generous with your files. I shall make this today, as my mojo is missing and this will make such a beautiful kick start for me. Thank you for the lovely files, Shirley. I can't wait to use them! J'aime beaucoup cette carte . It's marvellous ! Thank you very much. Have a nice day. I feel like I repeat myself over and over when I say beautiful card, Shirley. As usual, you have created a gorgeous card. Thank you for your generosity in sharing with us. Oh! magnifique, merci beaucoup pour le partage. Je vais pouvoir l'utiliser pour diverses occasion. Thank you for the pretty file. I like all your cards. Thank you. This is lovely and I see many possibilities for its use. Hi Shirley. Happy New Year. Thank you for today's card. You always manage to give us some thing unusual.Smiles. Jan. Thank you (again) for your wonderful file. Beautiful as always. It's going to be perfect for the spring celebration party card I'll be making. Thank you for sharing it. Thanks form this beautiful file!